This is my contribution to the Margaret’s Hope Chest Hope Squared quilt drive to benefit homeless children living in the Grand Rapids Public School District this holiday season. I interviewed the charity organizers, Carin Vogelzang, and her mother, Carol Peters, for the podcast and my column and wanted to do more than encourage everyone else to participate. 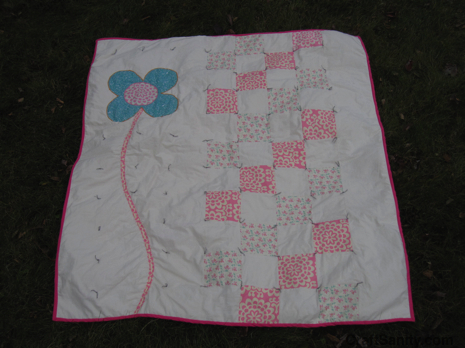 However, getting this quilt done proved more challenging than I had anticipated. 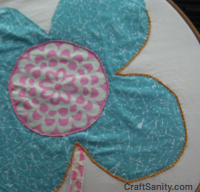 I lost about two weeks of my life to illness, then my sewing machine rebelled and kept jamming up when I finally got to the machine quilting part. So I decided to tie this quilt and call it good. Well, sort of. After I tied the patchwork square part of the quilt, I decided to do some embroidery around the flower and stem applique. This took awhile, but allowed me to spend some quality time with this quilt that will hopefully bring someone some warmth and comfort this winter. I find that when things start to “jam up” in my life, it’s a sign to slow down, and in this case, stitch by hand. I did an update interview with Carin and Carol and will be bringing you that update and photos once the final numbers are in. The good news is that they shattered their 400-quilt goal with donations totaling more than 500 quilts from quilters all over the world. Isn’t that awesome?! My quilt doesn’t hold a candle to many of the absolutely stunning quilts that were donated. Seriously, some of the quilts are off-the-charts fantastic. Kudos to everyone who participated and congrats to Carin and Carol who now have a stock of quilts to give to those in need of hope. Before this quilt drive they used to make most of the quilts they gave away by themselves. Please keep them in mind in the future if you ever want to donate a quilt or want to request a quilt for someone in need.